Mr. Wei, aged 41, first joined our Group in February 2012 as the general manager of Shanxi Grace Vineyard and he has also been the director of Shanxi Grace Vineyard since October 2015. He is primarily responsible for overseeing the daily operation of Shanxi Vineyard. Mr. Wei has over 17 years of experience in sales and marketing in the alcohol beverage industry. Since March 2015, he was the legal representative and director of Ningxia Ganlin and was responsible for overseeing the daily operation of Ningxia Vineyard, of which has been transferred to Ms. Chan, one of our Controlling Shareholders, through the Disposal completed on 1 June 2018. Prior to joining our Group, from June 2009 to March 2012, Mr. Wei worked as a business development project manager at Terra Cotta. From August 2006 to May 2009, he worked as the North West China regional sales manager in the sales and marketing department of Sichuan Jiannanye Sales Co., Ltd. (四川劍南液銷售有限公司) (principally engaged in the sale of “Jiannanye” branded baijiu. From June 2004 to July 2006, he worked as the North West regional sales manager at Luzhou Chunjiu Co., Ltd (瀘州春酒業有限公司) (principally engaged in wine distribution). From July 2003 to May 2004, he worked as a salesperson in the sales department of Fujian Hengfa Wine Co., Ltd (福建恆發酒業有限公司) (principally engaged in wine trading). From April 2002 to June 2003, he worked as a salesperson at the Xiamen branch of Fujian Fujitsu Co., Ltd (福建富士通有限責任公司). From September 2000 to March 2002, he worked as a supervisor in the marketing department of Hainan Yedao (Group) Co., Ltd. (SHA: 600238) (海南椰島（集團）股份有限公司) (principally engaged in the production and sales of liquor products). Mr. Wei obtained a higher diploma in law from the Shaanxi Administrative Cadre Institute of Politics and Law (陝西省政法管理幹部學院) in the PRC in July 2000. Mr. Lee, aged 36, first joined our Group in September 2006 and has been our production and technical director since November 2009. He is primarily responsible for overseeing the management of the cultivation bases, production and logistics departments of our Group. Mr. Lee has over eleven years of experience in the wine making industry. In September 2006, Mr. Lee first joined Shanxi Grace Vineyard as a winemaker assistant, and he was also a vineyard assistant and cellar hand. Prior to joining the Group, from July 2005 to July 2006, he was a northern region sales executive at Sony (Malaysia) Sdn. Bhd. From July 2004 to June 2005, he served as a northern region sales executive and wine buyer at Harrisons Wine of Harrisons Holdings (Malaysia) BHD, responsible for setting up a branch company in the northern region of Malaysia, sourcing new wine and managing the wine list. From May 2003 to June 2004, he was a sales executive at Denise Wine Shop (Malaysia) Sdn. Bhd. Mr. Lee obtained a higher diploma in hotel and tourism management and a higher diploma in hotel and catering management from Kolej Damansara Utama in Malaysia in October 2002. Mr. Wang, aged 37, first joined our Group in December 2007, and has been our deputy manager for production and quality control since February 2011. He is primarily responsible for overseeing the production and quality control of our wine products. Mr. Wang has over ten years of experience in the wine making industry. Mr. Wang was the manager of the production department of Shanxi Grace Vineyard from April 2009 to January 2011, mainly responsible for overseeing the production department and executing the production plannings. He was the vice manager of the same department from January 2009 to March 2009, mainly responsible for assisting the manager in supervising the production staff and production plants. From December 2007 to December 2008, he served as an assistant to the manager of the same department, mainly responsible for sourcing ancillary materials for production of our wine products. Prior to joining our Group, from August 2006 to May 2007 and from July 2005 to July 2006, Mr. Wang worked as a volunteer in the Bureau of Health of the Shuanghu County of the Tibet Autonomous Region (西藏自治區雙湖特別區衛生局) and in the Bureau of Husbandry of the Nagqu Prefecture of the Tibet Autonomous Region (西藏自治區那曲縣組織部、畜牧局) as part of the College Students to the West Voluntary Scheme (大學生志願服務西部計劃) where he was primarily responsible for assisting in the office staff on the basic operations of the departments. Mr. Wang obtained his bachelor ’s degree in rural regional development from Renmin University of China (中國人民大學) in the PRC in July 2005. Mr. Wang, aged 43, first joined our Group in March 2001, and has been our cultivation base technology supervisor since January 2012. He is primarily responsible for overseeing the cultivation technology and the management of our grape cultivation bases and has over 17 years of experience in the wine making industry. From 2013 to 2014, Mr. Wang was in charge of the acquisition of farmland from individual farmers by Shanxi Ziyuan and the transition of the Group’s sourcing of grapes in Shanxi from external procurement to self-cultivation. 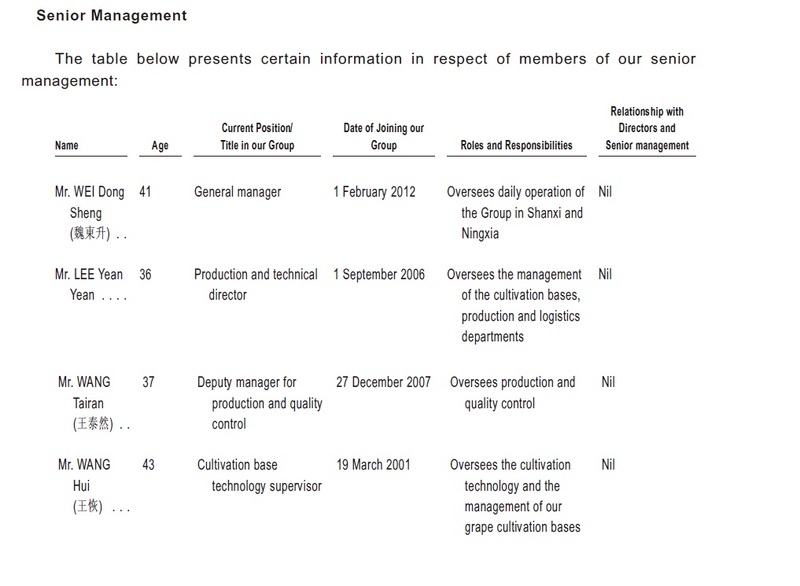 He was a manager of the cultivation base department at Shanxi Grace Vineyard from April 2007 to December 2011, mainly responsible for overseeing the operation of the cultivation base, including implementing standardised cultivation techniques for farmers and formulating a set of operation specifications for cultivation. From July 2005 to March 2007, he was the deputy manager of the cultivation base department at Shanxi Grace Vineyard, primarily responsible for providing assistance in overseeing the daily operation of the cultivation base. He served as an assistant of the cultivation base department of Shanxi Grace Vineyard from August 2002 to July 2005, mainly responsible for implementing different methods to standardise the cultivation techniques of grape farmers. When he first joined the Group in March 2001, he was an assistant of the cultivation base department at Shanxi Yayi Wine Co. Ltd.* (山西雅怡谷葡萄釀酒有限公司) (former name of Shanxi Grace Vineyard), primarily responsible for basic cultivation and monitoring work. In May 2007, May 2011 and May 2017, he has been elected as a member of the 12th Session, 13th Session and 14th Session of the Chinese People’s Political Consultative Conference of Taigu County (中國人民政治協商會議太谷縣委員會委員), respectively. Mr. Wang obtained his bachelor ’s degree in agriculture from Jilin Agricultural University (吉 林農業大學) in the PRC in July 1999.